I think December needs more days if I'm going to wear one of these each day til Christmas! Check out the great selection of vintage Christmas Tree pins at Vintage Gal Antiques! 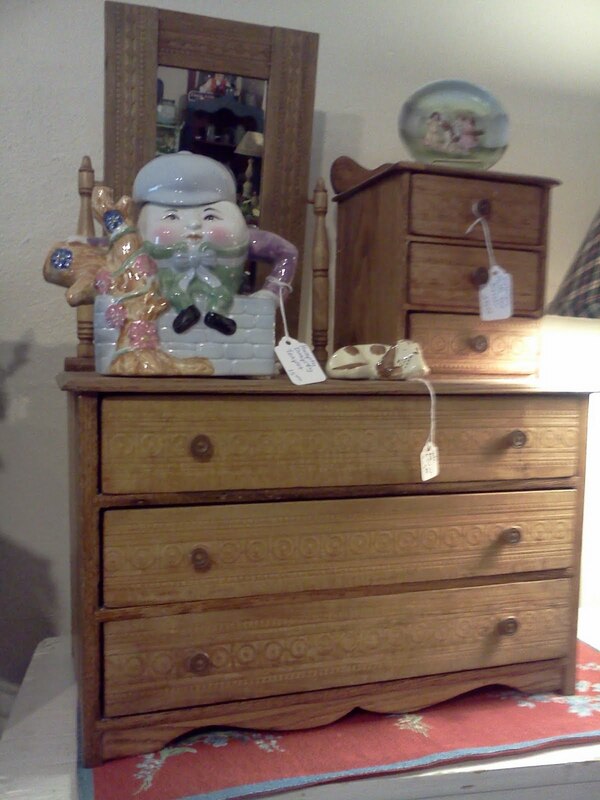 Vintage Gal Antiques will be open this Saturday, December 17 from 10am-4pm. Hopefully, the weather will stay nice for Christmas! I'm also going to be open Saturday, December 24 from 10am-2pm for last minute shopping, or just to stop in and say "hi"! 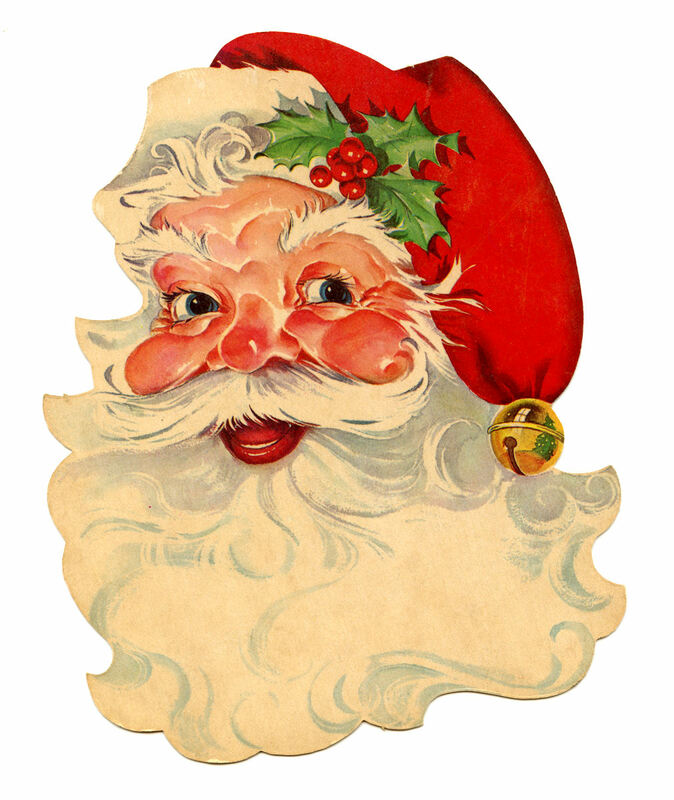 Have a wonderful Christmas and a delightful new year! Soft, time-worn embossed leather with a beautiful patina! That’s what you’ll find in a great selection of vintage tooled leather handbags at Vintage Gal Antiques. These are some of my favorites, so I’m always on the lookout for more of these fabulous bags to pass on to you! The embossing is so well done; roses, autumn leaves and scrolly designs. There is even a very nice briefcase with beautifully tooled designs. This one would make a great fashion statement in the business world. 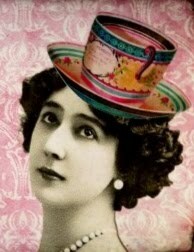 It’s not your cookie cutter briefcase~you could stand out among the other executives! There are several vintage “rockabilly” clothing items also available. The pictured shirt is an early Scully western cut embroidered shirt with pearlized buttons. Pretty cool! 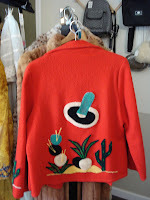 Looove the Mexican Souvenier Jacket! 1940's red wool with chenille sombrero and cactus designs on the back~so funky and retro! 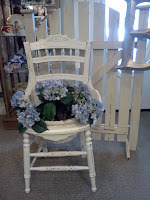 Vintage Gal Antiques is now open Thurs-Sunday and some Mondays. Summer is getting a very late start here in Downieville, but we’re keeping our summer schedule regardless of the weather! 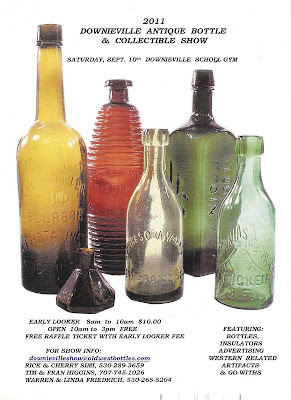 Hope you’ll make the trip and enjoy Vintage Gal Antiques and the rest of Downieville! 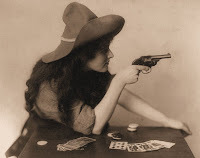 I love this sweet vintage photo! 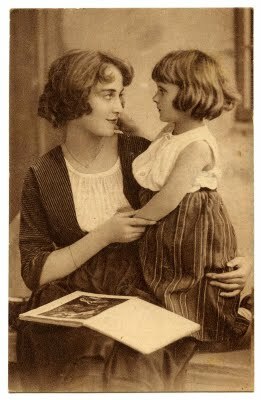 Happy Mother's Day to you. 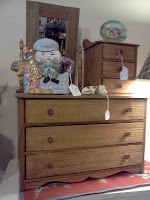 Recently I purchased a collection of antique toys, board games and children’s furniture. I’ve always loved the beautiful graphics in children’s books and on toys, and some of these items in this collection are wonderful. Wooden blocks with brilliant artwork, tin wind-up toys with complex mechanical action, and adorable doll furniture, detailed in wood cut-outs and designs are just a portion of the collection. One of the most unusual toys is this tin toy made by the German toy manufacturer Lehmann. Patented in 1895, the tin lithographed beetle will walk and flap its’ wings when you wind it up. One recently sold on Ebay for $300+! Of course, since then, several others have come up for auction and sold, but not for the high price the first one went for! There are also several sets of wooden puzzle blocks. The set pictured here is of the alphabet with pictures for each letter. Look at the block with the letter “Q”…what the heck is a “quagga”? It’s not in my dictionary, so I looked it up on Wikipedia and found that it is an extinct subspecies of the zebra. The only one photographed live was in 1870, so that helps to date this set, probably late nineteenth century. Antique toys were popular with children for two main reasons-the brightly colored lithography and the movements they made when wound up. These are also the same reasons they are so sought after by today’s collectors. 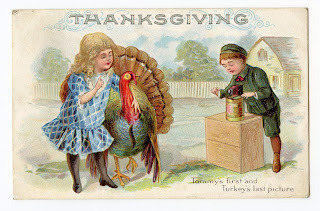 If your passion is antique toys~please come and check out my selection. 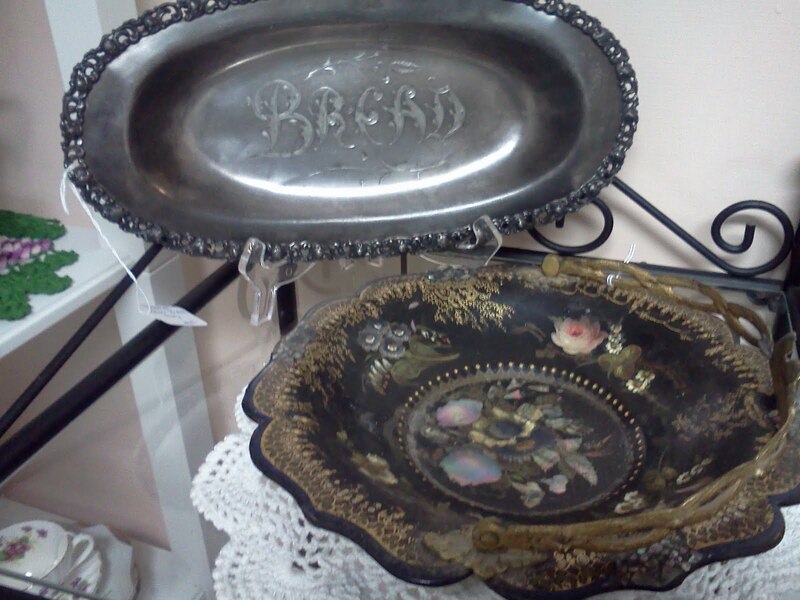 Priced modestly, you’ll find something to add to your collection at Vintage Gal Antiques. What the heck is a Quagga? Some Pretty Violets for a Spring Day! And Some More Posies to THINK S*P*R*I*N*G!! 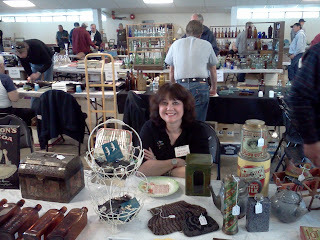 Vintage Gal Re~Opening for the 2011 Season! Saturday, April 16 is the re-opening date for Vintage Gal Antiques & Fine Things! The weather is getting warmer, the snow is melting and the shops are starting to open for another great season. I just finished doing a show in the Bay Area and brought back more wonderful old treasures. 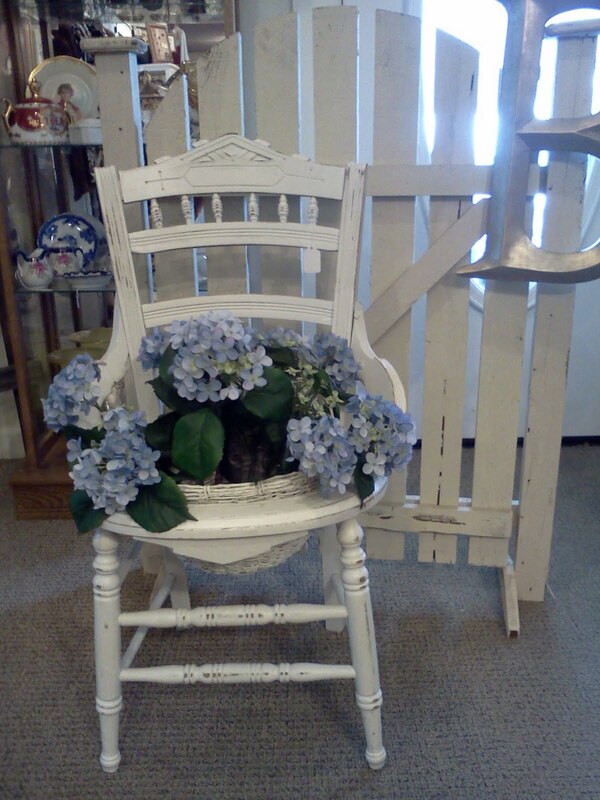 Hope you'll stop by sometime soon and visit Vintage Gal Antiques~the largest antique store in Sierra County! I'll be open weekends until mid-May and then open Thurs-Monday, 10am-4pm. Credit cards, checks and good old-fashioned cash are cheerfully accepted! Come and visit Downieville in the Gold Country on historic Highway 49! 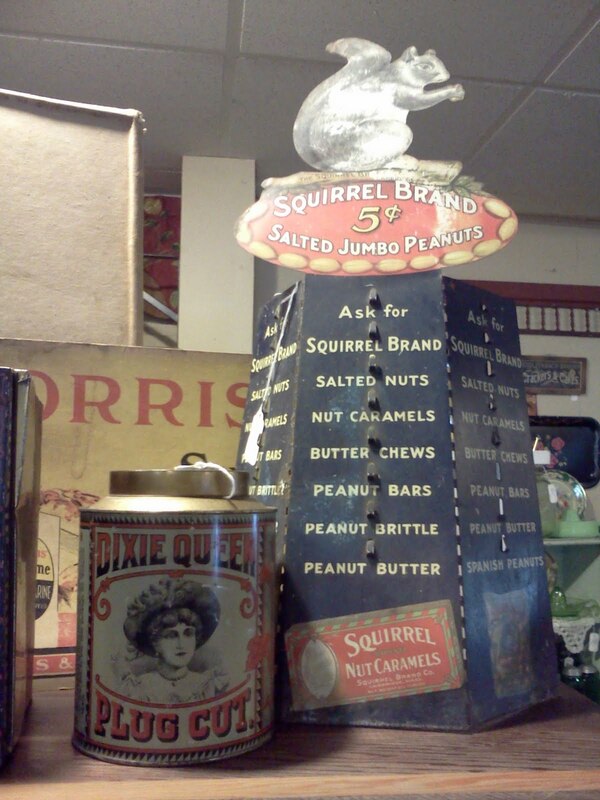 Hey, American Pickers~Look What I Found! One of the first things you’ll see when you walk into Vintage Gal Antiques is this rusty old motorcycle frame. And always~the first comment is “This looks like something the “American Pickers” would find!” I absolutely agree! 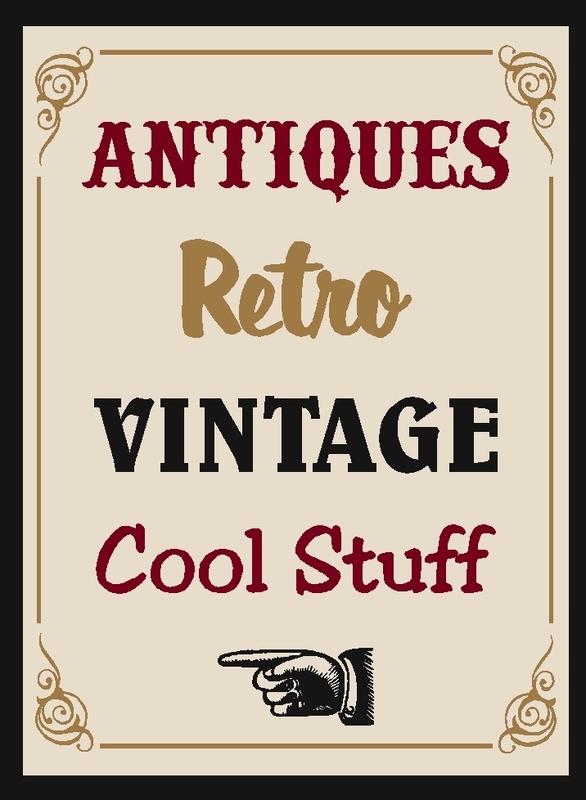 If you haven’t heard of them, the American Pickers are two guys who travel around the Midwest looking for rusty junk and unusual treasures. The show is on the History Channel and each week they investigate old barns, trash pits and fields, meet some really interesting characters (and hoarders) and find some great stuff. They especially love old bicycles and motorcycles and would covet this frame! What is it? It’s a Simplex Automatic motorcycle frame. The Simplex was the brainchild of Paul Treen, who started the company in the late 1920s with a $25 investment. The Simplex was built in New Orleans and was the only motorcycle ever manufactured in the southern part of the U.S. Production of the Simplex Automatic began in April of 1953 and continued until the end of motorbike production in 1960. I’ve used this frame as yard art, holding a pot of geraniums, but it would be great to find someone to rebuild it and get it running again. 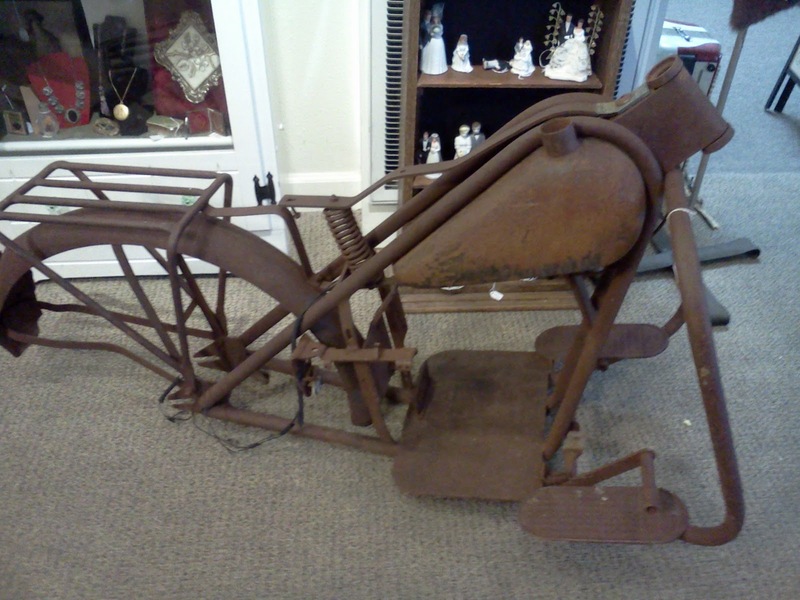 So…..come see me, American Pickers, or anyone else out there that wants a great little project bike! It's March 20~the first day of Spring~and we have snow, snow, and more snow here in Downieville! 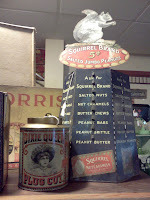 Vintage Gal Antiques will be re-opening for the 2011 season around mid April. I'm excited to get the shop open again-it's been a long winter! We did some traveling the last couple months and I was able to pick up some wonderful vintage treasures for the shop. In Victoria, B.C. I found some hand-painted chinaware and delicate English chintz pieces. And then the jewelry~ah, yes, always the jewelry! Vintage turquoise bracelets and rings! Some beautiful gemstone necklaces and to round it off- a few ladies antique pocket watches. Lots of irresistable treasures waiting for you to discover! Check back for some photos and hope to see you at Vintage Gal soon!